At Social Edge we know that thoughtful and well-executed use cases are the foundation of a successful community, so important that we’ve blogged about it here. A simple search of “use case” in JiveWorks also yields dozens of informative results. While information on use cases and their importance is plentiful, here is what you really need to know. 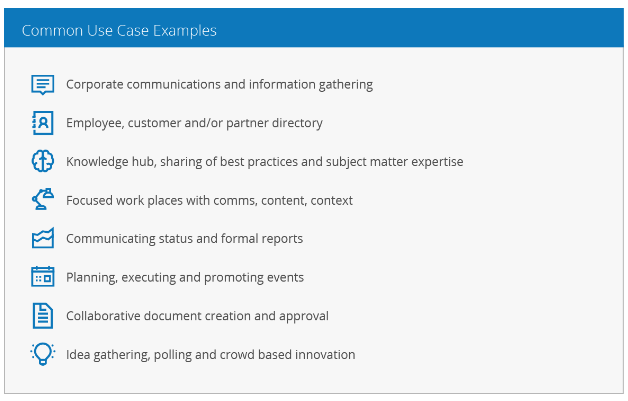 A use case defines critical work and activity for your organization. Put simply; think of a use case as a group of people working together to achieve a goal. For example, an internal team collaborating and planning a corporate event, or consumers submitting product feedback and enhancement ideas. Why start with a use case? A successful use case generates real business value while also providing the foundation for more organic community growth. Purposeful use cases allow community members to experience real value from the community, while also providing bright spots to inspire future use cases and additional value creation. What makes a good use case? A good use case addresses the six considerations outlined in the following chart, beginning with a clear purpose linked to a strategic initiative. Identify an initiative that would solve a problem and deliver real value (e.g., lower costs). As you think about this use case consider if you have executive sponsorship in place. Would this use case benefit more than one member or end user? Do you have the resources available to continually grow and support this use case? If the answer to all of the above is yes then you have a good use case. Now that you’re a use case expert, you can start to identify key use cases for your community or if you'd like more information, contact us for our use case questionnaire.